2. Triangle ABC has vertices A(2,6), B(8,-6) and C(-4,0), as shown. The triangle will be reflected in the x-axis. a) What is the y-coordinate of the image of point A? b) What is the y-coordinate of the image of point B? c) Which numbered choice is the point that remains fixed after the reflection? 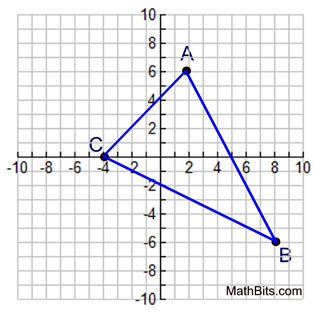 Open the following link to see a graph of the original triangle (ABC) and its reflection across the x-axis (A’B’C’).